Natures Aid Pro-Travel contains Pro-30 MAX, a daily complex containing 8 extensively researched strains of bacteria; L. acidophilus, L. plantarum, L. casei, L. reuteri, B. bifidum, B. lactis, B. longum and S. thermophilus providing 30 billion live bacteria per capsule. 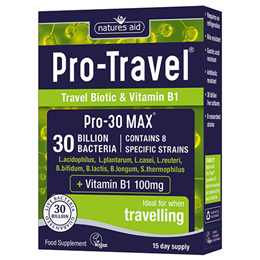 Pro-Travel also contains vitamin B1 100mg tablets. Vitamin B1 supports a normal energy yielding metabolism and contributes to the normal function of the nervous system. Pro-Travel has been specially formulated by bio-chemists and nutritionists based on scientific research. Microsrystalline Cellulose, Di-Calcium Phosphate, Thiamin (as Hydrochloride), Anticaking Agents (Vegetable Source Magnesium Stearate, Silicon Dioxide). Adults and children aged over 12 years: Take 1 vitamin B1 tablet (green blister) and 1 Pro-30 MAX capsule (blue blister) once daily with food. Below are reviews of Natures Aid Pro-Travel - Travel Biotic & Vitamin B1 - 15 Day Supply by bodykind customers. If you have tried this product we'd love to hear what you think so please leave a review.